In what may be the quickest price cut in recent memory, several UK retailers have slashed the price of Sony's new PSPgo to Â£199.99 after only one weekend of sales. Boy, the PSPgo has had an interesting ride. After being boycotted in Europe and Australia, called dead on arrival by a UK specialty retailer, finding its UMD conversion plans falling through, Sony still maintained that it expected more negativity for the device than it actually received. It's slightly odd, then, to see that several retailers in the UK are already dropping the price to below Â£200 - from Â£224.99 - after only one week of sales. Amazon.co.uk, Play, GAME, and HMV have all dropped the price of the handheld to Â£199.99. Meanwhile, Argos has offered a slight discount of its own to Â£219.99, and ShopTo - the chain that called it "Dead on Arrival" - will continue to charge Sony's full price of Â£224.99. It's all a bit puzzling, really. 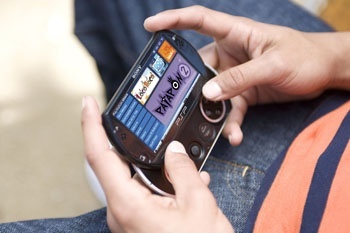 The main concern I'd seen of retailers was that the profit margin on the handheld itself was too slim to make much money off of sales, and the digital-distribution-only platform meant they couldn't recoup money off of used games. So their solution is to... make even less money (or even take a loss) off the PSPgo so that more people buy one and circumvent their brick-and-mortar stores entirely? Huh? Am I missing something here? Still, it's unlikely to be bad news for Sony, who announced that PSP sales had risen 100% with the introduction of the PSPgo to the market.